The cable used in green facades is constructed from multiple strands of wire, with each strand containing several wires. At Tensile, we use a range of sizes and configurations of wire cable, depending on project requirements. 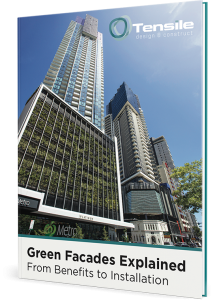 Wire cable for green facades also requires terminations or end-connections to prevent fraying, and a number of other components. So what components make up a wire cable? Eye-end – termination with flat ‘eye’ piece attached to allow connection to another component. External thread-end – threaded termination that screws onto another component. End-cap – small cap that fits over the end of the rope. Sleeves / ferrules – metal band that fits over the rope where it is turned back to form a loop. Swaged head-end stop – ‘swaging’ refers to the process of joining two ends together or one end onto another component. Turnbuckles – used to adjust the tension of the rope where it attaches to fixed point such as a post or wall. 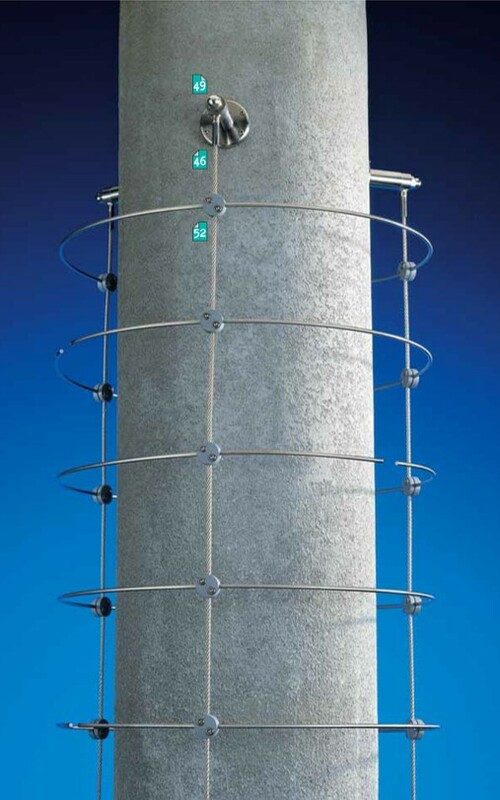 A number of other parts may be required in a facade installation, such as spherical post-fittings, clamps, rod systems, spacers, support washers and more. The components used in facades need to have a high breaking strength – typically 90%. The breaking strength is determined by testing the cable under tension until breaking point is reached. A facade installation needs to be properly engineered to ensure it will withstand strong winds and other forces, particularly in the case of multi-storey buildings. The choice of cable components and fittings will depend on the requirements of the project. At Tensile, we will thoroughly assess what is required of the cable, and design a tailored solution that takes into account functionality, cost, aesthetics and client needs. If you have a green facade project in mind, contact us to find out how we can help.